Help Eliminate Your Garage Clutter?" A garage organizer can go a long way towards helping to eliminate a cluttered garage floor and is one of the best garage storage and garage organization ideas devices you can buy. The one shown at the left gets garage and household cleaning tools up and off of the floor onto a neatly organized heavy-duty hanging device that mounts to the structure of your garage wall. The one shown here sits 4" out from the wall to keep your tools such as mops from touching the wall. It features six (6) spring-activated, heavy-duty rubber cams that provide superior grip for all types of handles. Constructed of steel and finished in FDA compliant EXL-COAT® in a white gloss powder coat finish. Mounting hardware is included. When it comes to garage organization ideas and garage storage — this is the way to go! These units either bolt to the wood studs in your garage wall or mount into masonry anchors if your walls are concrete block or poured concrete. Installation is fairly simple and requires medium-skills with power tools and a level. You can determine what length of unit you may need for your garage by estimating the number of tools and implements you plan to arrange. Estimate that 5 tools will fit in every 3' long space. Your garage organization ideas and garage storage plans will all come together once you get your garage and household tools up and off the floor. The wall mounted garage organizer for garage and household cleaning tools will go a long way toward helping eliminate clutter on your garage floor. Plus, when you want a specific tool, it is easy to spot visually for fast access. There is also a safety factor with these devices that you don't get with your tools leaning against the wall or lying on the floor. Once the tool is hanging — it is out of action! It can't be stepped on or act as a lever in the case of a curved tool that has its handle propelled into the air by stepping on its curved business end. 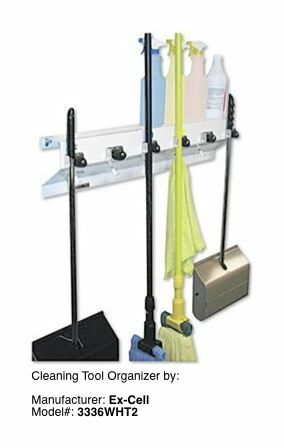 For fast access of those garage and household cleaning tools that are used often — nothing beats a wall mounted garage storage handle rack device. The hand tool organizer shown at the left is invaluable as a tool storage device for those small hand tools that are needed around the home for repairs and fixes. They are essential for your garage storage and garage organization ideas planning. These units come in various lengths (24-1/8" shown) and can be mounted onto your garage wall pegboard. If you have or plan for a workbench in your garage, they can be mounted directly above the work surface for quick, easy and safe access for use on the project at hand. Your garage storage and garage organization ideas planning should always include these necessary storage implements. One of the nice things about the small size of these units is that they can be mounted to the pegboard in a row, or one above the other. Or, you can purchase them in longer lengths than is shown in the photo above. Quick and easy visible access to the small hand tools they store, is a great advantage when your are searching for that special tool you need — right now! When working on your garage organization ideas and garage storage plan — don't forget to include garage organizer devices as shown here that will get some of your items onto the walls and off of the floor. 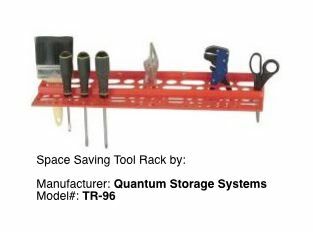 Are you searching for other garage organization and storage devices? Use our Custom Search Box below to find them.